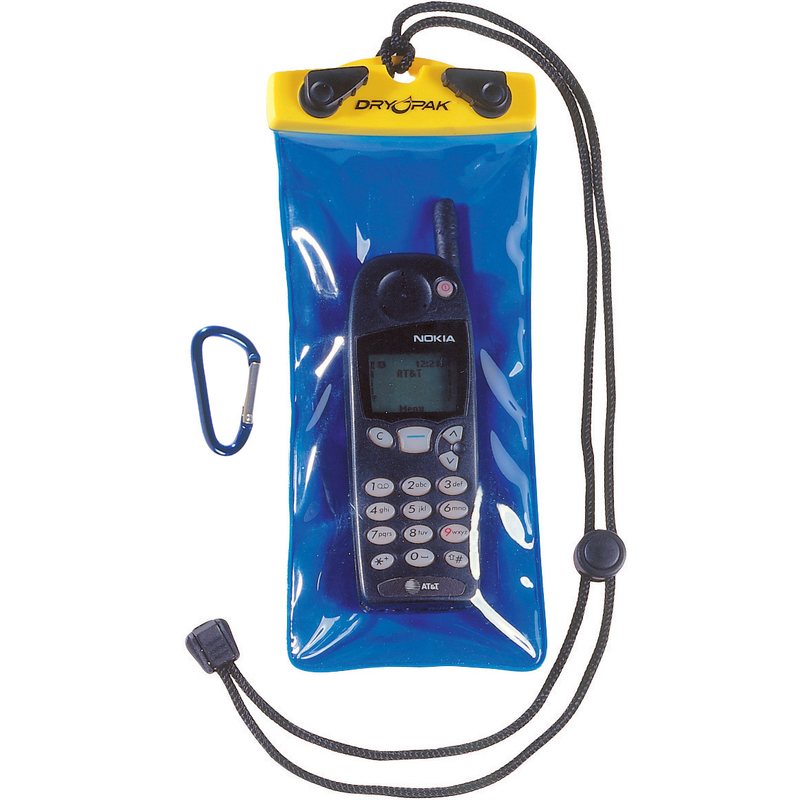 Description: A 100% waterproof case for your electronics. Operates phones, GPS's, cameras, PDAs, and VHF radios through the case. Seals out water, sand, and dust with a simple twist of the knobs. All cases float. Guaranteed submersible. Talk and listen through the case. Lanyard and spring hook. 4" x 6". 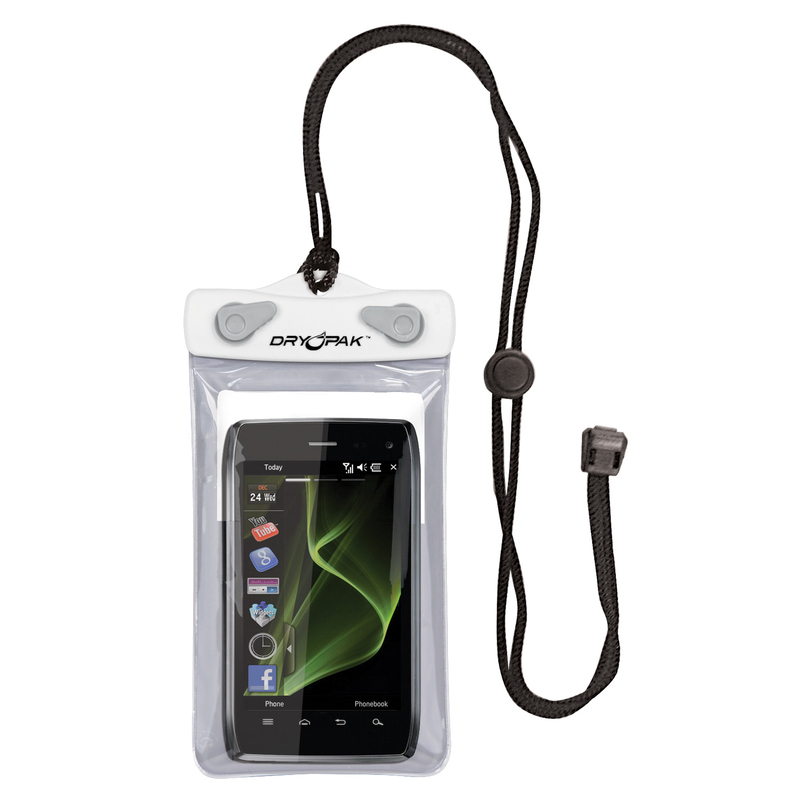 Description: A 100% waterproof case for your electronics. Operates phones, GPS's, cameras, PDAs, and VHF radios through the case. Seals out water, sand, and dust with a simple twist of the knobs. All cases float. Guaranteed submersible. Talk and listen through the case. Lanyard and spring hook. 4" x 8". Description: Features Perforated neoprene padded body stretches to securely hold most cell phones. Accommodates wearing on left or right side. Hook and loop flap closure with swivel belt clip. Size - Small Item weight - 0.14 lbs.Features Perforated neoprene padded body stretches to securely hold most cell phones. Accommodates wearing on left or right side. Hook and loop flap closure with swivel belt clip. Size - Small Item weight - 0.14 lbs. Description: The perfect size for your cell phone or MP3, this Dry Pak lets you take pictures through a clear window on the back. Case features frosted TPU on the outside, and clear TPU inside. Yellow sealing clip offers high visibility while you're at the beach, pool, or snorkeling. 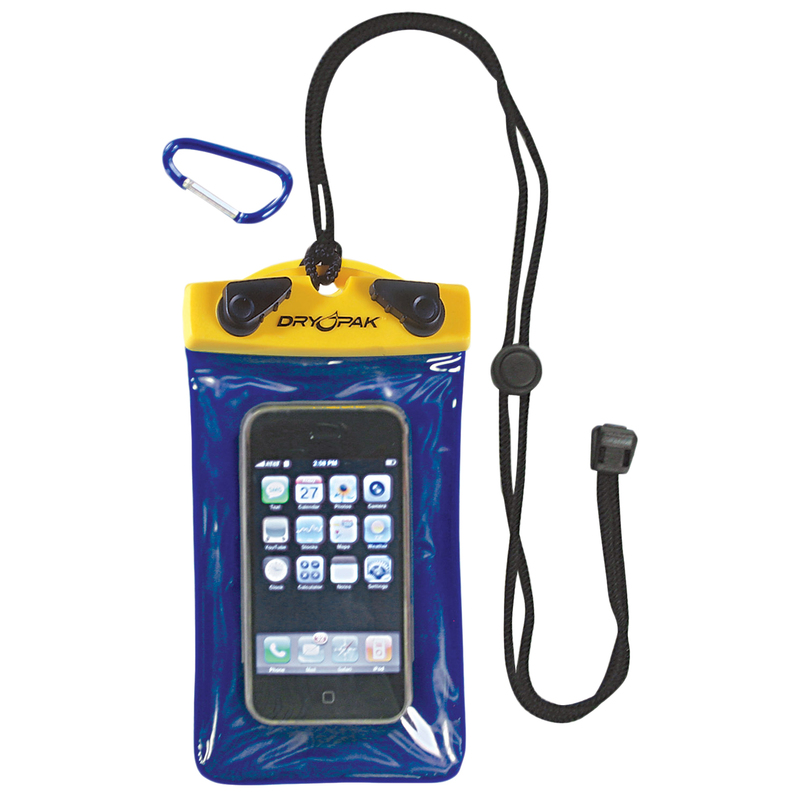 This Dry Pak comes with an adjustable neck lanyard and anodized aluminum spring hook. 4"W x 6"L.
Description: Eclipse - Minature TR1 Tri-Wing Screwdriver for cell phonesSpecially designed for video games and PCs. Made of hardened S2 alloy steel. Shaft #0 Tip Size. Overall length approximately 5.25". Description: This regular fit twill pant sits at the waist, with a traditional fit through the seat & thigh & slightly tapered leg openings. The pant is crafted from a strong, wrinkle resistant poly/cotton twill work cloth, which has a stain-release finish to prevent stains from setting in. Designed to last in tough work environments, it has a resilient 2-piece waistband. Our signature tunnel belt loops provide enhanced support for belts. An extra pocket on the leg provides added storage. Features Pre-curedThis regular fit twill pant sits at the waist, with a traditional fit through the seat & thigh & slightly tapered leg openings. The pant is crafted from a strong, wrinkle resistant poly/cotton twill work cloth, which has a stain-release finish to prevent stains from setting in. Designed to last in tough work environments, it has a resilient 2-piece waistband. Our signature tunnel belt loops provide enhanced support for belts. An extra pocket on the leg provides added storage. Features Pre-cured fabric. Twill, 65% polyester and 35% cotton. Color - Dark Navy. Size - 34 - 30. Item Weight - 1.17 lbs. Care InstructionMachine Wash. About DickiesThe Company is the leading global brand of innovative and trusted work wear. The brand has an unwavering commitment and proud heritage of providing tough, quality clothing to workers for almost 90 years. The Dickies has grown from bib overalls to World War II U.S. military uniform to its. Description: AmeriLeather Cell Phone/Fanny PackThe AmeriLeather Leather Cell Phone/Fanny Pack has seven zipped pockets and is a perfect waist bag for your cell phone, palm pilot, camera and much more. Also features a hidden rear zip-pocket perfect for storing extra cash and necessities. The fanny pack features an adjustable nylon waist strap which extending up to 46-Inch waist. Description: Features Loose fit. Convenient extra pocket on leg. No iron, stain release fabric with crisp permanent crease means they look great wash after wash. Tough tunnel belt loops. Reinforced double knee for super durability. Wrinkle resistant. 8.5 oz. twill fabric, polyester and 35% cotton. Color - Charcoal. Size - 36 - 32. Item Weight - 1.46 lbs. Care InstructionMachine Wash. About DickiesThe Company is the leading global brand of innovative and trusted work wear. The brand has an unwaveringFeatures Loose fit. Convenient extra pocket on leg. No iron, stain release fabric with crisp permanent crease means they look great wash after wash. Tough tunnel belt loops. Reinforced double knee for super durability. Wrinkle resistant. 8.5 oz. twill fabric, polyester and 35% cotton. Color - Charcoal. Size - 36 - 32. Item Weight - 1.46 lbs. Care InstructionMachine Wash. About DickiesThe Company is the leading global brand of innovative and trusted work wear. The brand has an unwavering commitment and proud heritage of providing tough, quality clothing to workers for almost 90 years. The Dickies has grown from bib overalls to World War II U.S. military uniform to its.